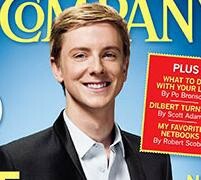 Chris Hughes, who has a lot of money, has bought a “majority share” of The New Republic, which has been sitting rather sadly on the auction block, getting hotter and more spoiled, like a cube of bloody meat on a stump in a dusty town square. Who will buy this delicious, if exceedingly tiny, piece of meat that has been sitting in the sun for days now? It comes with a long and storied and difficult and often ugly history! Hughes will! And now he has taken the title of “Editor and Publisher” of TNR, whose mindshare was stolen by The Atlantic, Talking Points Memo, and Slate, Salon and probably Thought Catalog. Okay, buddy. I like you. First step. Renounce at least one of those two titles. Isn’t, like, “owner” good enough anyway? Okay, and: just don’t talk to the press at all until 2013. Be quiet and do things. It works. And don’t talk about magazines and iPads too much, it’s a dicey subject. Plus, let’s be honest, Jumo was kind of a hot mess tech- and success-wise, and you barely got out of that one intact, though, “selling” it to Good was the best possible resolution to that, so, yay. Hmm, what else? Right: also, remember to have a good time!